7Gif has been a longstanding animated gif player for Windows. It does require the Microsoft .Net Framework 3.5 which Microsoft has integrated into Windows 7 and newer versions of the operating system natively. The app looks like many other media players on start. Use the load button or drag & drop to load an animated gif into the program to play it immediately. The core functionality is not really different from the majority of players out there. You can pause and stop playback for example. What sets 7Gif apart from many other players is a number of extra features that it supports. You can zoom in or out for example, or force the animated gif to fit to the program window automatically. 7Gif supports options to navigate the gif frame by frame forward or backward. This can be useful to take a closer look at specific frames which you cannot really do without that functionality. Another feature that 7Gif supports is to speed up or slow down the playback of the gif. Many of the playback options are accessible via keyboard shortcuts as well. The cog icon hides several other options of interest. It enables you to save the current frame as an image or all frames, print the current frame, check file properties which reveal information about the resolution and size among other things, or load the advanced settings that you can use to configure the program's functionality in detail. 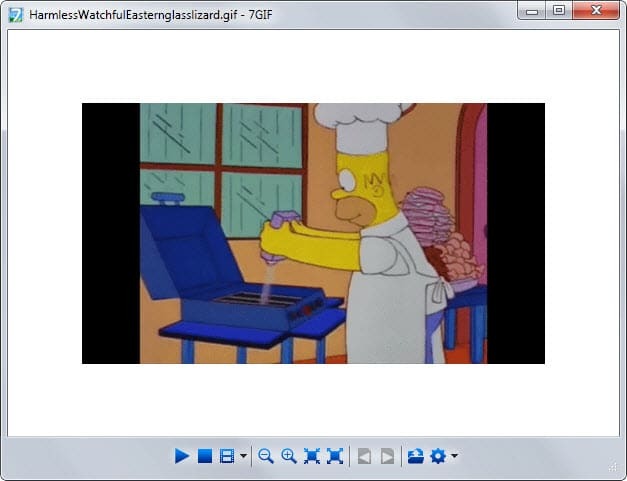 7Gif is a specialized application to play animated gifs on Windows systems. While it is not the only program to offer that functionality, its extra features may make it worth it especially if the default media player used on the system does not support some that you require. It is likely however that the majority of users don't need the program. Now You: What do you use to play animated gifs? I open animated GIFs rarely on my com and have no need to zoom in or stop playback. I have it installed and I like it. I had really hoped that APNG would have become a standard and popular because it’s superior to GIF in many ways. If Chrome and Internet Explorer provided native support like Gecko based browsers and Safari does, things might be different but it is what it is. Thanks for sharing Martin, this looks like an interesting tool indeed.. I did not use to enjoy viewing this kind of images, as most of the ones I had encountered were of such an abominable lack of quality and size. But this tool is really great in making many of them enjoyable nevertheless. I also like its ability to export all frames, so that they can at least be edited in other applications and recombined in Photoscape or Real World Paint. My default viewer for all images is Faststone , so far also for the occasional gifs but I associated gifs with this tool now. It is just what I am looking for. You can slow down, frame by frame, you can make it bigger…excellent little program.